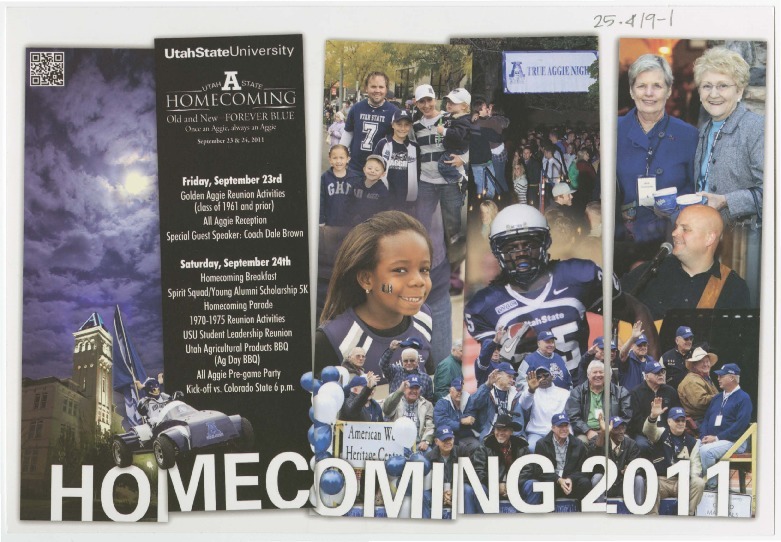 Mailer - USU homecoming 2011, "Old and New, Forever Blue." Mailer, sent by Alumni Association, detailing the events of Homecoming 2011, "Old and New, Forever Blue." Utah State University Special Collections and Archives, Miscellaneous Homecoming Materials, Record Group 25.4/9-1, Box 1. Utah State University Alumni Association, “Mailer - USU homecoming 2011, "Old and New, Forever Blue. ",” USU Digital Exhibits, accessed April 24, 2019, http://exhibits.usu.edu/items/show/18287.